Currency pair Pound Dollar GBP/USD completes the trading week near the 1.3077 area. The pair continues to move as part of the formation of the correction and the downward model «Wolfe Wave». Moving averages indicate a downward trend. At this point we can expect an attempt to grow and test the resistance area near the level of 1.3255. Next, the beginning of the decline in quotations of the pound dollar to the area below 1.2365. In favor of the fall of the British Pound will test the resistance line on the indicator of relative strength index (RSI). The second signal will be a rebound from the upper border of the «Wolfe Wave» model. 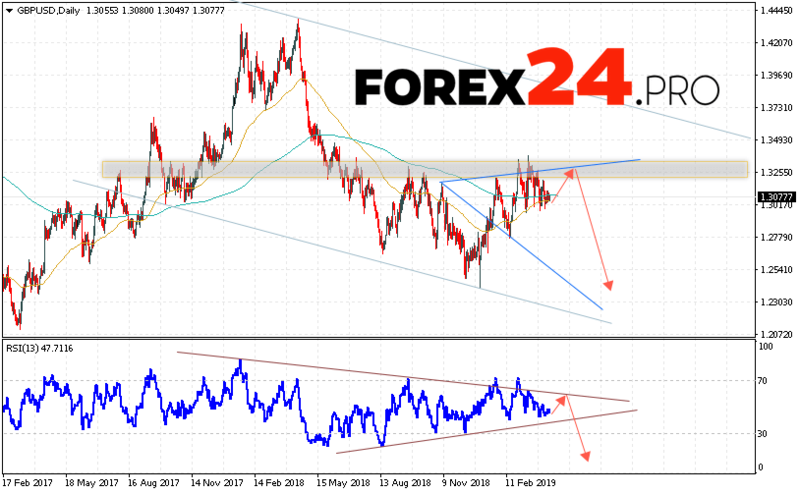 Cancellation of the option to reduce the pair GBP/USD in the current trading week April 15 — 19, 2019 will be a strong growth and a breakdown of the 1.3545 area. This will indicate a breakdown of the upper limit of the model and continued growth in the region above the level of 1.3750. Confirmation of the fall in GBP/USD will be the breakdown of the support area and the close below 1.2945. Among the important news from the UK that may affect the Pound Dollar rate, it is worth highlighting: Consumer price index, Changes in the volume of retail sales, taking into account the cost of fuel, Changes in the number of applications for unemployment benefits. GBP/USD Forecast and Analysis April 15 — 19, 2019 implies an attempt to test the resistance level near the 1.3255 area. Where can we expect to continue the fall of the pair with the goal below area 1.2365. An additional signal in favor of reducing will be a test of the trend line on the relative strength index (RSI). Cancellation of the fall of the pair Pound Dollar pair will be a strong growth and the breakdown level of 1.3545. In this case, we should expect the pair to continue to grow with a potential target above the level of 1.3750.